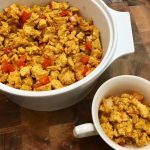 Tofu Scramble is a plant powered comfort food and a welcome guest at breakfast, lunch and supper. It even makes a great snack. 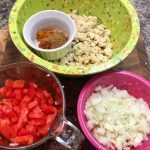 The addition of peppers and onions adds a nutritional and colorful punch. The warm flavors of cumin and chili powder appeal to people of all ages. Serve it up with your favorite salsa, ketchup, vegan mayo. Measure spices, salt and garlic powder into small bowl. Drain Tofu and squeeze lightly to remove some of the excess water. Using hands, crumble tofu, leaving pieces of different sizes for add interest and texture. Dice onions and peppers and put into separate piles. Heat veggie broth, water or oil in a medium size skillet or wok. Add onion and cook over medium heat for 5-7 minutes until translucent, stirring occasionally. Add more water or broth as required to prevent sticking and/or burning. Add diced pepper to pan and cook over medium heat for 5-7 minutes. 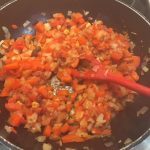 Add salsa to pan and stir on medium-high for 2-3 minutes until veggies are glazed. Coat bottom of pan with 1-2 tbsp olive or other oil and add tofu. Sauté on medium heat for five minutes or so, turning a couple of times. Add water to spices, salt and garlic powder and stir to combine. Add sauce to tofu and stir to coat. Cook for another 5-7 minutes until tofu is slightly browned. Return veggies to pan and heat through. Add shredded plant based cheese if using. Stir on low until cheese is melted. Over-handled and over stirred tofu is tough tofu, so let's not do that. 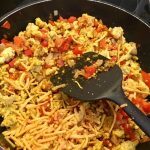 If you like lots of heat in your scramble, increase the sauce, omitting the turmeric. Scramble can be made ahead and stored in the fridge. Bring to room temp and reheat in microwave or oven. Don't be surprised if there aren't any leftovers. To make this a whole food plant based delight omit the salt, oil and plant based cheese. 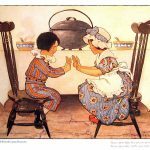 Since I seem to love adapting recipes from the collections of admired chefs and bakers, both vegan and non vegan, it is fitting that I adapt an old nursery rhyme about porridge made from peas: a much beloved rhyme that my mother recited to me and I, in turn, recited to my kids. Not sure if I regaled my grand kids with it – maybe not, come to think of it. 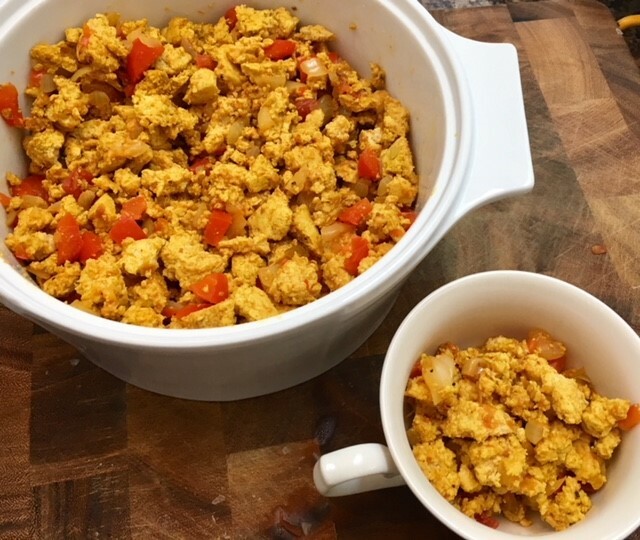 Now, I would not recommend keeping tofu scramble in the pot for nine days, or for that matter, any other food needing refrigeration; but trust me, if you make this for your family it will not last that long, hot or not. BTW, it is very tasty cold. 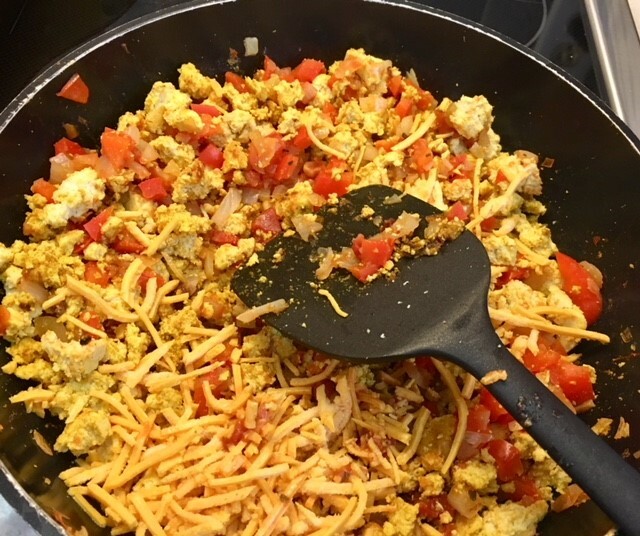 I modify recipes which are solid to begin with, such as Minimalist Baker’s Southwest Tofu Scramble, featured here. I tweak them to suit my personal taste and that of my family. I am also mindful that I am often cooking for little ones who may not go for the taste of cooked kale or spinach, for instance. 1) Tofu – squeezed, not pressed. The water it contains adds moisture to the dish and helps to prevent sticking, especially if not using oil. 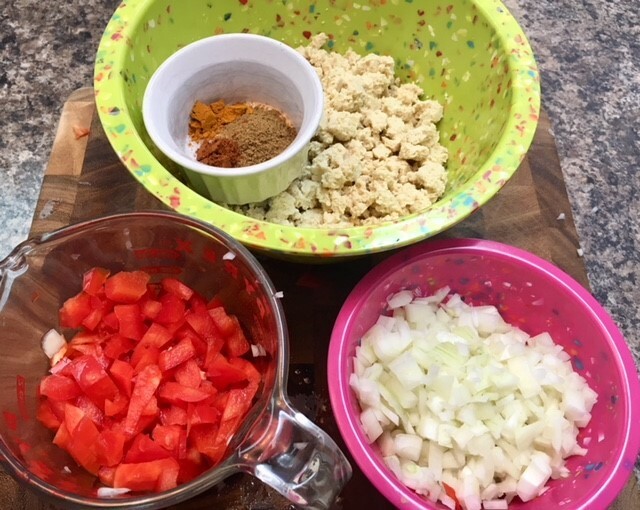 2) Veggies – cut into a dice making for more pepper-y and onion-y deliciousness in every bite. 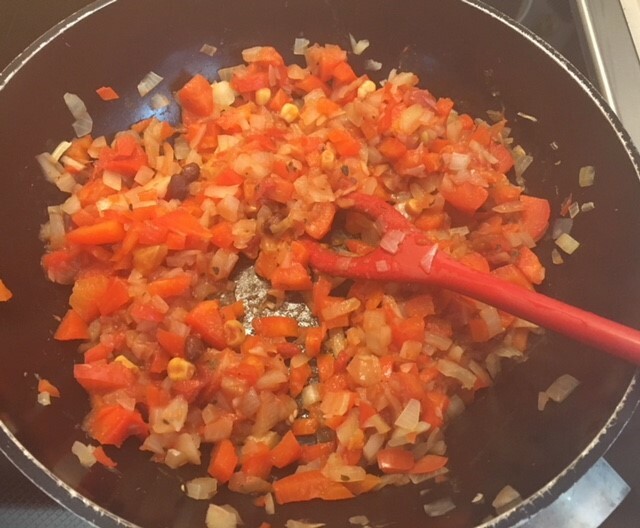 3) Tomato Based Salsa for a little zing and to give the veggies that glazed look. 4) Kale does not sound like a good fit for my family, so I left it out. 5) Plant Based Cheese Shreds add a little more texture and flavor to an already delightful dish. 1) Bring dish to room temperature. 2) Microwave: reheat on high for 2-3 minutes depending on the strength of your microwave. 3) Oven: preheat to 325 F and put the timer on for 15 minutes or so. 2) your fave green salad, as in adding back in the greens that I left out of the scramble. 3) Sweet Potato Rice, which can also be made ahead, BTW. Over-handled and over stirred tofu is tough tofu, so let’s not do that. Don’t be surprised if there aren’t any leftovers. To make this a whole food plant based delight, omit the salt, oil and plant based cheese.